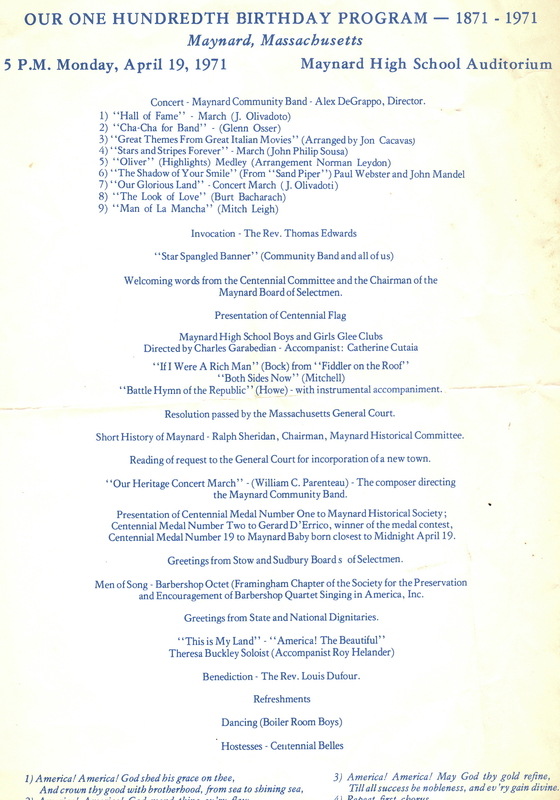 A program for a celebration during the Centennial celebration, dated April 19, 1971. It was held in the Maynard High School Auditorium. The Concert was presented by the Maynard Community Band, Alex DeGrappo, Director. Alex DeGrappo, Rev. 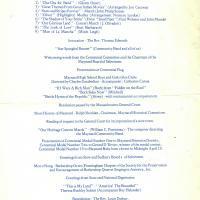 Thomas Edwards, Charles Garabedian, Catherine Cutaia, Ralph Sheridan, Gerald D’Errico, Rev. Louis Dufour. Paper, 8.5 x 11.5 in. “"Our One Hundredth Birthday Program" - 1871-1971,” Maynard Historical Society Archives, accessed April 24, 2019, http://collection.maynardhistory.org/items/show/6366.